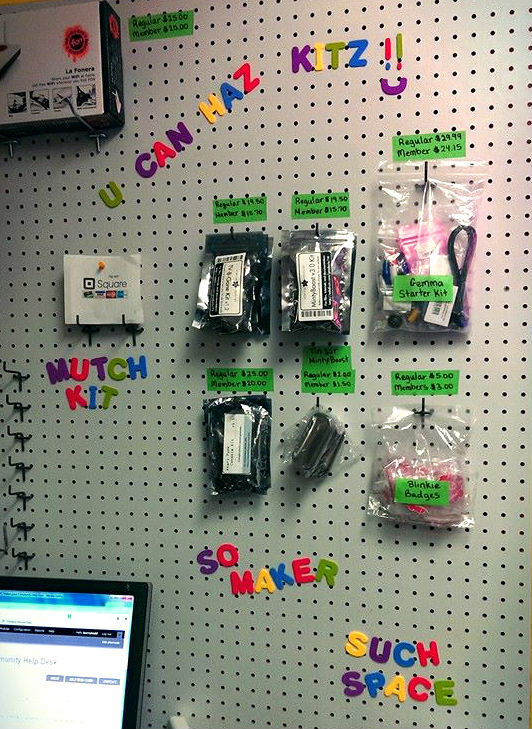 Comments Off on New Kitz at Makerspace! TV-Be-Gone: Turns off almost any kind of television so you don’t have to watch Fox News at the pub anymore! MintyBoost: A battery powered charger for any electronic device that uses USB. Charge your phone on the go! In the club! on a hike! Never be without Facebook again. NEVER. Gemma started kit: Tired of the same old boring clothes with absolutely NO LEDs?? Suffer no more! This Gemma starter kit will get you on the way to the long term goal of being seen from space! Atari Punk Console: This noisemaker will be sure to delight any parent or grandparent. What exactly does it do? Brings joy through noise. Get one today, kids. Blinky Badge: The world’s most entertaining and affordable way to learn how to solder! Your new skillz will be accompanied home with a LED decorated robot badge, which is only appropriate. Fonera Router: This ready to hack router is perfect for introducing you to the world of Open Source Router Software! With a few easy steps you can hack this router to do all kinds of things the large router companies routinely block you from doing with their locked down software. More about OpenWRT and installing it on the Fonera.